The Margos are back and they are ready to rumble! This was actually one of the more popular episodes back in our first season but we knew we could make it sound so much better so here’s to another REDO ep! In 1967, 17-year old S.E. 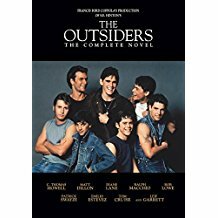 Hinton published her first novel, The Outsiders which became one of the first YA novels that was a hit with both teachers and students. Susie (as she prefers to be called if you know her) wrote the novel based on experience living on the rough side of the tracks in Tulsa, Oklahoma. Her improbable rise to the top of the YA novel heap is one of publishing’s more interesting stories and the Outsiders still sells almost 500,000 copies per year! The 1983 film directed by Francis Ford Coppola is one of the signature films for a whole generation of tweens in the 80s. Everything in this lush production is discussed in this episode from the amazing cast to the cinematography and the rather unfortunate Stevie Wonder theme song. S.E. Hinton’s backstory and how she remains true to her roots to this day.